The EX620 is the latest addition to MSI's Entertainment Series of notebooks and features a 16-inch widescreen display, Core 2 Duo processor, discrete ATI graphics and a host of other goodies for your multimedia pleasure. MSI's EX620 is a nicely designed notebook, stuffed full of multimedia features with a very keen price tag. It has all the performance you'll need for everyday use, but it is let down somewhat by its keyboard. For potential buyers of MSI EX620, the most important question that they should ask themselves is: what are your needs and what are you going to use this notebook for? Actually this is the question you should ask yourself before purchase of any notebook. Detail that we didn’t like on this model is soft keyboard that bends during intensive typing. All the rest is top quality and top speed. Price for tested MSI EX620X-04EU is little bit higher compared to similar notebooks. This is above all, consequence of Blue-ray reader that is included in the package. If you do like this model but you don’t need Blue-ray reader you can go for EX620X-052EU model that has similar configuration (slightly smaller hard disk and no Blue-ray) and spare 150€. A well-specified and feature-packed HD compatible laptop, but performance is low. In recent months, many manufacturers have released true-widescreen laptops to great acclaim. MSI is the latest to follow suit with the EX620-207UK, but while its screen and specification are strong, it fails to truly impress. While the limited performance, mobility and usability of the MSI prevent it being an essential purchase, its HD features and vibrant screen even the balance somewhat. If you're in the market for an affordable HD laptop, you could do worse than give the EX620 a test run. 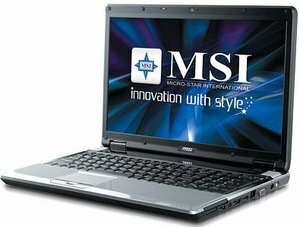 Amidst the prevalence and success of MSI's Wind netbook, which has graced our pages regularly and in various incarnations, it's sometimes difficult to remember the company also does some very interesting notebooks. Today we're taking a look at the EX620, a 16in entertainment notebook that on paper seems to have it all: an Intel Core 2 Duo CPU, discrete ATI video card, Blu-ray drive, Dolby Home Theater audio and a speaker system supported by an inbuilt subwoofer. MSI has gone to town on its EX620 multimedia notebook in terms of features and has made it very affordable into the bargain. This makes it a sensible option for those looking for good all-rounder, but little flaws like the awkward keyboard layout and only average styling, screen and speakers are worth bearing in mind before you buy. 75.14%: This rating is not convincing. The laptop is evaluated below average, this is not really a recommendation for purchase.